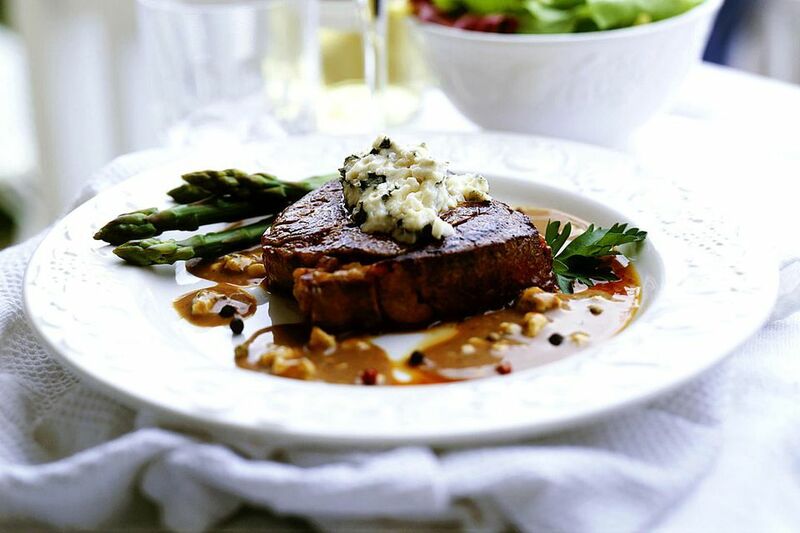 A creamy peppercorn sauce with bourbon flavors these delicious beef tenderloin steaks. This is an excellent dish to prepare for a Valentine's Day or an anniversary dinner. Heat olive oil in a medium skillet over high heat until hot. Sprinkle tenderloin steaks with kosher salt and pepper. Sear the steakson both sides in skillet. Remove from skillet, and place on a rack in a broiler pan. Broil 4 to 5 inches from heat for 4 to 6 minutes on each side or until meat thermometer registers 125° for rare or 135° for medium rare (145° for medium). Add bourbon to drippings in skillet; bring to a boil over medium heat, and deglaze pan, scraping up the browned bits from the bottom of the pan. Add minced garlic, peppercorns, basil, oregano, and salt; cook, stirring, for 1 minute. Add whipping cream; bring to a boil. Cook, stirring frequently, for 6 to 7 minutes or until sauce is reduced by half; remove from the heat. Whisk in sour cream. Spoon the sauce over steaks. Serve with hot cooked rice or baked potatoes. Garnish with chopped fresh parsley, if desired.